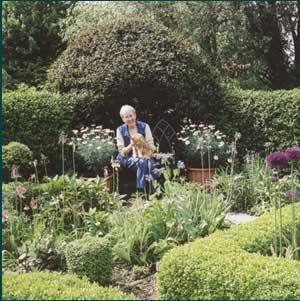 I have a a small but very intensively planted garden with clipped box hedges, topiary and standard roses. I don't grow anything very large or exotic, preferring old-fashioned flowers such as pansies, sweet peas, pinks, antirrhinums, irises and alliums in great profusion. In the spring the garden is full of bulbs. I particularly love tulips and try to grow different ones each year besides my old favourites. I'm very fond of auriculas which I grow in a cold frame, bringing them out when they are at their best. I have a small glasshouse in which I overwinter my pelargoniums and marguerites and grow tomatoes and aubergines in the summer. 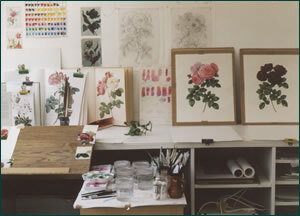 I use many of the flowers for my paintings and often plant things especially to paint. 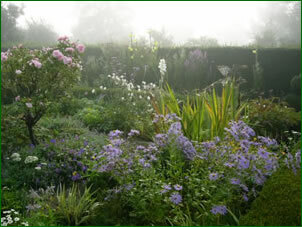 I prefer blue, mauve, pink and white flowers which seem to suit the dark box hedges best. But, by mid-summer I have to allow yellow, orange and red because I love nasturtiums, marigolds and dahlias too much to exclude them. In spite of my careful planning, there is usually a mix of colours by the end of the season. 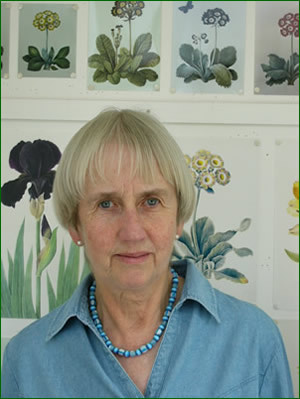 I paint botanically accurate and minutely detailed plant portraits in watercolour. I am not really a botanical illustrator. The paintings are concerned with texture, richness of colour and dramatic tone and are carefully composed on a white background. Because of the transitory nature of plants, I take a lot of photographs of a subject before I start and make colour studies.I then draw out the composition which can take several days to complete, afterwards transferring the image to the paper I am going to work on before starting to draw. I use a magnifying glass. Hopefully the flower, or one like it, is still available when I draw out the image very lightly with a hard pencil, making many alterations to the composition and the subject as I work. I include every detail - even down to the pollen on every stamen. Still using a magnifying glass, I begin to paint. Often I go over the drawing with a very fine brush and then work in quite dry and very thin washes, building up the colours gradually. Over the following days I gradually build up layer upon layer of paint until I feel that it is the best I can do. The whole process may take anything from two to six weeks. Some of the commissions I receive are for birthday or anniversary presents and some are requests to record a favourite flower - often from the client's own garden. Because my paintings take so long to complete and there is usually a waiting list, it is best to contact me several months in advance of your deadline if possible. Prices start at £500. You can telephone me direct on 01728 648748 or email me by clicking here. Limited-edition prints of some of my paintings are available from Pauntley Prints. Please click to visit their site.